Epoxy.com offers many different types of seamless flooring. We offer so many kinds that sometimes it confuses people. The purpose of this article is to explain the differences, and to help you choose the right epoxy seamless flooring system for your application. In some cases the right seamless flooring system will not even be an epoxy. It may be polyurethane or Methyl Methacrylate (MMA). Epoxy.com Epoxy Chip Flooring on a VT Interstate Rest Area – Taken over 15 years after installation. Epoxy.com Product #1 – www.epoxy.com/1.htm – meets all the criteria above. It has good chemical resistance, and excellent cost to benefit ratio. Great for warehouses, in areas with high traffic and only modest chemical exposure. Epoxy.com Product #1ESD – www.epoxy.com/1esd.aspx. This is the same as product #1 above but has conductive filler in it. Depending on the primer you use under this system it can be conductive (100,000 – 1,000,000) ohms of resistance or Electro-Static Dissipative (ESD) which is 1,000,000 to 1, 000,000,000 ohms. Used in plants that produce explosive materials like ammunition, fireworks, flairs, or explosive solvents, and used in areas of sensitive electronics, like computer server buildings, avionics, electronics assembly and electronic production areas. Epoxy.com Product #2 – www.epoxy.com/2.aspx. This is similar to product #1 but with a much higher chemical resistance. This major increase in chemical resistance is offset by only a small increase in the cost of the #2 over the Product #1. The product #2 is well suited for applications like garages, machine shops, sewer tank floors, battery rooms, cooling towers, grooming shops, dog kennels and all areas where an economical chemical resistant coating is required. Epoxy.com Product #633 – www.epoxy.com/633.aspx – is a highly chemically resistant epoxy floor coating and flooring system. Like Product #1 and Product #2 is extremely durable. Product #633 is typically used in areas where containment of aggressive chemical is imperative. For example Product #633 will hold up to continuous exposure of 98% Sulfuric acid for a period of at least 6 months without loss of structural integrity. Great for secondary containment for a large number of chemicals. Epoxy.com Chip Flooring – www.epoxy.com/chips.aspx – is the perfect blend of economy, durability, low maintenance, and gorgeous appearance. It uses a 100% solids pigmented epoxy base coat, a full broadcast of plastic chips, and two coats of chemical resistant clear glaze. The chemical resistant glaze also makes this easily the most non-yellow epoxy top coat available today. This easy to clean chip flooring system is best for high traffic areas where appearance, durability and low cost of ownership is a must. Great for commercial and residential kitchens, bathrooms, showers, grooming shops, kennels, veterinary clinics, garage floors, show rooms, rest areas, and much more. This product can be installed with an integral cove base. Epoxy.com Chip Flooring can be installed by a contractor but easy enough to be installed by a home owner. Epoxy.com Chip Flooring can be installed in a residence but is rugged enough to be used in the most demanding commercial applications. These solid colored floors are based around self leveling, trowelable or double broadcast application techniques. These floors are sometimes called shop floor. They are made to be thick and extra durable under extremely harsh environments. They can be top coated with any of the systems above under coatings. This kind of flooring is available in 3 speeds of cure: normal, fast, and cold cure. Solid colored flooring is also available with an integral cove base. The big advantage of MMA is speed of curing. Each coat of MMA will cure hard to the touch in 1-2 hours. This allows the next layer to be applied quickly and traffic to be returned to it quickly. You can even build a fast setting integral cove out of MMA resin. I personally installed MMA on one kitchen floor with a very tight schedule. The restaurant was only closed for breakfast. The project started with rotten plywood floors. At 10 PM the carpenters came in to work. They removed rotten floor and floor joists. They replaced the floor joists and the plywood. At 5 AM I went in with my crew and we primed the floor and sealed up the joints in the wood and the screw holes. At 6:30 AM we laid the floor. At 8 we put a glaze coating on the floor and by 10:30 the restaurant workers were on the floor prepping for lunch. The floor installation from start to traffic took just 5.5 hours. Polyurethane Decking – http://www.epoxy.com/elastomeric.aspx – is the system best used in areas where maximum flexibility is necessary. This is typically outdoors, waterproof applications like balconies. We have a number of systems that are specialized flooring like conductive and ESD (Electrostatic Dissipative) flooring – www.epoxy.com/conductive.aspx – and various hybrid systems. If your project does not seem to fit in the categories above email me at norm@epoxy.com or call us at 352-533-2167. In conclusion we offer many types of seamless flooring systems, they can be used for commercial and residential applications. These systems are durable, economical, and easy to install even by homeowners. These seamless flooring systems may be made out of epoxy, polyurethane, or methyl Methacrylate (MMA). Seamless flooring systems are available in multicolored or solid colored. They range in chemical resistance from very good to resistant to aggressive chemicals. When in doubt what is right for your project send me an email at norm@epoxy.com or give me a call at 352-533-2167. We want you to have the “Right Resin Product for the Right Job”, so we are always looking to improve our systems with new epoxy technology and new epoxy resin formulations. Today we are featuring a Methyl Methacrylate MMA not an epoxy. We are not just about epoxy but we want you to have the right resin system for your job. 684LV – MMA CONCRETE CRACK HEALER and SEALER replaces Epoxy.com Product #685. MMA CONCRETE CRACK SEALER Product #684LV is a 100% reactive ultra-low viscosity methyl methacrylate resin used as a penetrating crack sealer or to fortify extremely porous concrete substrates. MMA CONCRETE CRACK SEALER Product #684LV is typically used on bridge decks, parking structures, and floors or as a general penetrating sealer to prevent moisture intrusion. One of the major advantages of MMA CONCRETE CRACK SEALER Product #684LV is its very low viscosity. It is about the viscosity (thickness) of diesel fuel, so it soaks into the concrete and down into small cracks quickly. It hardens in about an hour. When it hardens it hardens with a bond strength to clean concrete that is greater than the tensile strength of that concrete. In other words you have just chemically welded the two sides of the crack together, so that it is as if the crack had never happened. The very fast setting time allows you to install you flooring or sealer system the same day that you repair your crack. At Epoxy.com we are all about systems. Combining the right resin product to create the right system for your job. Epoxy.com Methyl Methacrylate (MMA) repair and patching resins for vertical surfaces, can be placed very economically. Surfaces repaired with Epoxy.com MMA Systems can be opened to traffic quickly (typically in two hours or less), dramatically reducing turn around time and the inconvinence associated with the longer down time of other materials . Epoxy.com Product #680 Methyl Methacrylate (MMA) Polymer Concrete is a Polymer Concrete methyl methacrylate (MMA) reactive resin is used as a binder to develop polymer concrete which produces extremely high strength and chemical resistance with an abrasion resistant surface. It is prepackaged and preproportioned for easy mixing and placing at the job site. The liquid polymer and the preproportioned hardener filler is mixed either in the polyethylene bag or in a mortar mixer. Epoxy.com Product #680 Methyl Methacrylate (MMA) Polymer Concrete comes in convenient 1/2 cubic foot packaging. That makes Product #680 the perfect choice for small to medium patching jobs where a fast setting material is required. If you do not need a fast setting material, Epoxy.com Product #25 Epoxy Mortar Kit is an excellent alternative. Product #685 MMA Crack Healer and Sealer is for injection repair or as a penetrating crack repair and sealer on concrete. It is a two component Methyl Methacrylate resin system that polymerizes in place. The extremely low viscosity will penetrate into concrete cracks as fine as 0.003 inches. This is an excellent cost effective substitution for Epoxy injection an a level horizontal Surface. Use Epoxy.com Epoxy Injection for structural cracks in vertical surfaces. Epoxy.com Methyl Methacrylate (MMA) Seamless Flooring and Seamless Decking Systems may be installed on most surfaces, including old or new concrete, wood, and metal. Epoxy.com Methyl Methacrylate (MMA) Seamless Flooring and Decking Systems are waterproof. Epoxy.com Methyl Methacrylate Flooring Systems can be used as a solid color, with colored quartz, or Epoxy.com Flooring Chips. Epoxy.com Product #692 Flexible Methacrylate can be used for crack isolation and waterproofing where movement is anticipated. Epoxy.com Methyl Methacrylate (MMA) Seamless Flooring and Seamless Decking Systems are very easy and fast to install. They can even be installed at temperatures down to -22°F allowing them to be used in Freezer Rooms and extend the installation season for outside seamless decking and seamless flooring applications. The Epoxy.com Methyl Methacrylate (MMA) Flooring and Decking Systems are wear-resistant, shock absorbing (impact resistant) and can take full traffic and loads within 2 hours of installation. Epoxy.com Product #690 Medium Viscosity Methyl Methacrylate (MMA) Sealer and Top Coating is a 100% reactive, medium viscosity methyl methacrylate resin developed as a sealer/topcoat over Epoxy.com Product #697 and Epoxy.com Product #698 Methyl Methacrylate (MMA) Flooring and Decking Systems. Epoxy.com Product #691 Methyl Methacrylate (MMA) Primer is a 100% reactive Methyl Methacrylate primer for all Epoxy.com MMA floor and wall systems. Epoxy.com Product #691 Methyl Methacrylate (MMA) Flooring Primer also provides excellent filling and sealing as a scratch work filler (with filler added) to level uneven floor and wall surfaces. Epoxy.com Product #691 Methyl Methacrylate (MMA) Flooring Primer is a reactive Methyl Methacrylate resin, which hardens rapidly with the addition of Epoxy.com Product #695 MMA hardener, even at low temperatures. Epoxy.com Product #692 Flexible MMA Membrane is a Flexible Methyl Methacrylate (MMA) Flooring, Decking Bridge Mortar Resin is a higher viscosity, 100% reactive, flexible (up to 300% elongation) Methyl Methacrylate resin used as a crack isolation or waterproofing membrane under Epoxy.com Product #697 Methyl Methacrylate (MMA) Based Resin Systems. Epoxy.com Product #692 Flexible Methyl Methacrylate (MMA) resists cracking caused by horizontal substrate movement providing a crack resistant, resilient surface. Epoxy.com Product #692 Flexible Methyl Methacrylate (MMA) offers stress relieving properties for floor slabs showing movement and/or vibration. It may also be used by itself when maximum flexibility of the entire system is required. When used by itself Epoxy.com Product #692 MMA Membrane must be sealed with Epoxy.com Product #693 Semi-Flexible MMA Coating. Epoxy.com Product #693 Semi-Flexible MMA Coating is a 100% reactive, medium viscosity methyl methacrylate resin developed as a topcoat for exterior or interior use with Epoxy.com Product #692 Flexible MMA Membrane based Systems. Epoxy.com Product #695 Methyl Methacrylate (MMA) Coating is semi-flexible designed primarily for outside use and will not yellow after curing. Its excellent clarity makes it ideal for sealing color quartz and vinyl flake systems. It is excellent for exterior applications such as parking decks, concrete and steel stairs, ramps, solid wooden decks, concrete and patios as well as numerous other applications. Epoxy.com Product #694 Pigment Packs for use in all Epoxy.com Methyl Methacrylate Products #690 – Product #699, and for use in Epoxy.com Products that are available in a neutral tint base. Available in 15 colors plus black and white. Epoxy.com Product #695 Hardener Powder (BPO) for Epoxy.com MMA Flooring Systems is for use with Epoxy.com Products #691, #692 and #693. Epoxy.com Product #695 Hardener Powder (BPO) for Epoxy.com MMA Flooring Systems dosing can be changed due to temperature and desired set time / working time. Epoxy.com Product #695 must be well mixed with Epoxy.com MMA before adding any other aggregates and fillers. After mixing the Epoxy.com Product #695 Hardening Powder into Epoxy.com MMA the polymerization reaction which leads to the hardening of the MMA begins. Epoxy.com Product #697 Methyl Methacrylate (MMA) Binder Resin – a 100% reactive methyl methacrylate binder resin and top coat for self leveling, broadcasting, and troweled mortar systems. Epoxy.com Product #697 Methyl Methacrylate (MMA) Binder Resin is ideal for decorative troweled and broadcast quartz floors and industrial surfacing subject to heavy loads and traffic. Typical thickness of this system is between 1/8 inch and 1/4 inch thick. Epoxy.com Product #698 Methyl Methacrylate (MMA) Binder Resin is a 100% reactive, low viscosity, flexible methyl methacrylate resin for use as a binder for low resin content troweled mortars and polymer concrete. The resin is ideal for making repairs and to change the slope on floors, bridge decks and joint headers. Epoxy.com Product #698 Methyl Methacrylate (MMA) Binder Resin can be installed as thick as 2.5 inches in one operation. Epoxy.com Product #699 Low Viscosity Methyl Methacrylate (MMA) Sealer is a 100% reactive, low viscosity methyl methacrylate resin developed as a chemical resistant sealer/topcoat. Epoxy.com Product #699 Low Viscosity Methyl Methacrylate (MMA) Sealer cures to a hard, scratch and wear resistant surface and is specifically designed for dry service in areas subjected to high traffic such as manufacturing areas, aisles, lobbies, service areas, and numerous other applications. Epoxy.com Product #699 Low Viscosity Methyl Methacrylate (MMA) Sealer is used as a sealer for Epoxy.com Product #697 and Epoxy.com Product #698 Methyl Methacrylate (MMA) Binder Resin Systems . Here is a list of the current Epoxy.com Products. In addition to the products below, we also have products which we can “custom” make to your specifications. This page is the most frequently updated on our website. So please check this page often, to see our latest product additions. Epoxy.com Product #1 All Purpose Coating is a 100% solids epoxy Hi-Build epoxy coating used for high foot and light forklift traffic areas where abrasion resistance is required; for protection against mild corrosion; and as a decorative waterproof coating for walls, floors, tanks, etc Available in normal, fast, and Cold Temperature Cure versions. Epoxy.com Product #1 Cold Temperature Cure is a version of Epoxy.com Product #1 that sets even faster than Product#1 Fast. Typically used in colder temperatures, or where an very fast cure is required. Epoxy.com Product #1W is a two component, 100% solids epoxy Hi-Build epoxy coating used for high indoor traffic areas where abrasion resistance is required; for protection against mild corrosion; and as a decorative waterproof coating for walls, tanks, etc. Epoxy.com Product #1 ESD Electrostatic Dissipative Epoxy Coating for Flooring is an ultra high solids bis-A epoxy floor coating designed to provide electrostatic control properties to various surfaces including concrete or other nonconductive substrates. Epoxy.com Product #2 Chemical Resistant Coating is a two component, 100% solids epoxy chemical resistant coating used to protect chemical concrete, steel and other structural materials from non-oxidizing acids and alkalines for both interior and exterior applications. Available in normal, fast, and Cold Temperature Cure. Epoxy.com Product #2 Cold Temperature Cure & is a version of that sets even faster than Epoxy.com Product#2 Fast Cure. Typically used in colder temperatures, or where an very fast cure is required. Epoxy.com Product #2W Chemical Resistant Wall Coating is a two component, 100% solids epoxy chemical resistant coating used to protect chemical concrete, steel and other structural materials from non-oxidizing acids and alkalines for both interior and exterior applications. Epoxy.com Product #4 Urethane Injection is a one-component, “Acetone Free”, MDI based hydrophilic sealing and grouting compound used to stop water leaks in wet environments. Epoxy.com Product #4 Urethane Injection, as it mixes with existing water, cures rapidly into a tough, flexible, closed-cell compound which is insoluble to water and most other chemicals. Epoxy.com Product #5 Fast Set Gel Adhesive is a 100% solids high-mod epoxy gel adhesive used for vertical and overhead bonding applications and structural repairs. It is also used as a grout for anchor bolts, dowels and rebar. Epoxy.com Product#6 Gel – Normal Setting Adhesive is a high-mod epoxy gel adhesive used for vertical and overhead bonding applications and structural repairs. It is also used as a grout for anchor bolts, dowels and rebar. Epoxy.com Product #7 All Purpose Epoxy Bonding Agent is a two component, 100% solids epoxy resin system designed to bond new concrete to old and other materials to concrete. It has a convenient 1:1 mix ratio, by volume with a viscosity similar to heavyweight oil. It exceeds the requirements of ASTM C-881-90, Types I, II, IV and V, Grade 2, Class “B” and “C”. Epoxy.com Product #7SC is a 100% solids high-mod epoxy adhesive used to bond fresh concrete to cured concrete, steel to fresh or hardened concrete, as a grout for anchor bolts, dowels and rebar, as a binder for epoxy concrete, and for bonding other dissimilar materials. It is similar to Epoxy.com Product #7 but with a slower cure to allow more time for concrete pours. Epoxy.com Product #9 Mortar Adhesive uses 100% solids Epoxy with graded aggregates. Urethane and Epoxy finish coats provide specific performance characteristics as needed. It is a resin patching, flooring, and/or repair system consisting of 100% solids epoxy resin and aggregates which provide heavy-duty protection at 3/16″ to 1/4″. When grouted an sealed, Epoxy.com Epoxy Standard Mortar eliminates porosity and produces a dense, skid-inhibiting finish that will minimize dirt and chemical penetration. Epoxy.com Product #11 Epoxy Joint Filler is a 100% solids flexible epoxy joint filler for saw-cut joints of concrete slabs on grade, or to repair existing slabs. Epoxy.com Product #11 Epoxy Joint Filler absorbs the impact and shock of heavy loads and steel wheeled traffic, preventing erosion of control joint edges. Epoxy.com Product #12 Epoxy Primer is a two component, seamless 100% solids epoxy primer system with High Chemical Resistance and High Bond Strength. The epoxy may be applied as a primer for most High End Industrial coatings, like Epoxies, MMA, Polyurethane’s, Vinyl Esters, Polyesters, etc. Epoxy.com Product #15 Chemical Resistant Flooring Resin – a two component, seamless 100% solids epoxy resurfacing system with High Chemical Resistance. It may be applied as a coating, or combined with silica sand or Epoxy.com multi-colored quartz aggregate to produce a durable, easy to maintain floor, on both new and old surfaces. Epoxy.com Product #15 Chemical Resistant Flooring Resin has superior clarity and UV stability. Epoxy.com Product #17 Decorative Stone Overlay Adhesive Resin – a two component, 100% solids high-mod epoxy adhesive used for bonding stone and other aggregates in all types of flooring applications. Some uses would include patios, pool decks, walkways and other areas where a long wearing and decorative system is desired. Epoxy.com Product #18 General Purpose Epoxy – a hard set epoxy compound formulated for general use. Epoxy.com Product #18 cures at room temperature and is a low viscosity system. This durable, resilient material requires no post curing to achieve permanent bond strength. Mixing ratio of 1 to 1 makes this product easy to use. Epoxy.com Product #18 General Purpose Epoxy solves many difficult bonding, and epoxy mortar problems. Product has the ability to bond to a variety of substrates including cannot dry and hard to dry surfaces. Epoxy.com Product #20 Epoxy Grout – a moisture insensitive, two-component, 100% solids epoxy resin system manufactured specifically for use in temperatures of 40°F and below. It is recommended for injection or anchor-bolt grouting in the neat state or as a mortar when mixed with up to 3 1/4 parts of Epoxy.com Product #76 – Epoxy Filler (by volume). Epoxy.com Product #20 Epoxy Grout exceeds most requirements of ASTM C-881-90, Types I, Grade 1, Class A.
Epoxy.com Product # 22 Underwater Epoxy Mortar that is a moisture insensitive, two-component, 100% solids epoxy resin. This material is specifically designed for use with the Epoxy.com Fiberglass Systems & Shapes, as well as your own custom forms. Can also be used as self-leveling flooring. Epoxy.com Product #25 Epoxy Mortar Kit standard – a 100% solids epoxy resin and specially selected aggregate system. Units are preproportioned for ease of mixing and use on the jobsite. It is a flowable, self-leveling grout, with handling and physical characteristics superior to similar grouts. Epoxy.com Product #26 Epoxy Mortar Kit – This data sheet is here for reference only. This product has been replaced by its new and improved version Epoxy.com Product #26HP. Epoxy.com Product #26HP Epoxy Mortar Kit – is a high strength, non shrink, 100% solids epoxy grout. Epoxy Resin and specially formulated aggregate produce a fluid, non shrink precision grout. Units are preproportioned for ease of mixing and use on the jobsite. Epoxy.com Product #26HP Epoxy Mortar Kit has superior handling and physical characteristics when compared to conventional epoxy grouts. Note: This is not a stock item, please allow up to 2 weeks for us to manufacture this for your order. Epoxy.com Product #27 Long Pot Life Mortar Kit is a preproportioned 100% solids epoxy resin pack and a blend of special aggregate. The pot life of Epoxy.com Product #27 Long Pot Life Mortar Kit is 3 times longer than ordinary epoxy packs; while curing the entire pack, a low exotherm is produced. Epoxy.com Product #28 Epoxy Mortar – Honey Clear Mortar 4:1 Ratio a multipurpose colored epoxy binder for Epoxy.com Mortar Systems This all purpose epoxy resin is characterized as an excellent general purpose material with good clarity and color retention. It is essentially odorless and can therefore be used in occupied areas. Epoxy.com Product #29 Cold Temperature Cure Mortar is a specially formulated binder for cold temperature applications. Able to cure at temperatures as low as 35°F. They are often used in coolers and food preparation areas that require constant low temperatures. Product #29 Cold Temperature Cure EPOXY MORTAR is also frequently used in room temperature applications to meet super-fast cure, limited shutdown needs. Epoxy.com Product #31 Medium Viscosity Low Modulus Epoxy Resin Mortar System is a two component, 100% solids, Zero (0) VOC moisture insensitive epoxy resin system mixed at a 2:1 ratio. Its low modulus of elasticity permits greater “give” under stress from impact and thermal change. When Components “A” and “B” are mixed together, color will be light straw. Epoxy.com Product #31 Medium Viscosity Low Mod Epoxy exceeds the requirements of ASTM C-881-02, Types I, IV & V, Grade 2, Class B & C.
Epoxy.com Product #32 Flexible Epoxy Membrane is a flexible resin used as an epoxy membrane and as a Product #32 mortar. Epoxy.com Product #32 Flexible Epoxy Membrane is a two component, 100% solids epoxy used as a base in many Epoxy.com Floor and Mortar Systems. Epoxy.com Product #32 Flexible Epoxy Membrane resists cracking caused by horizontal substrate movement, providing a crack resistant, resilient, sound absorbent, waterproof, durable floor. Epoxy.com Product #32 Flexible Epoxy Membrane offers stress-relieving properties for floor slabs that show movement or vibration. Epoxy.com Product #32 is excellent for use in areas such as mechanical equipment rooms, large animal rooms and activity centers. Epoxy.com Product #39 Silane Penetrating Sealer is a one component water based silane that provides excellent protection to concrete surfaces against attack from wet/dry, freeze/thaw cycles, and de-icing chemicals. Epoxy.com Product #39 Silane Penetrating Sealer imparts a hydrophobic “water-shedding” effect to concrete, masonry, brick, stone & wood surfaces. The water repellency helps reduce cracking spalling, chemical degradation, biological growth, efflorescence, and dirt pick- up. Epoxy.com Product #39 Silane Penetrating Sealer is easy to use and meets all current VOC regulations. Epoxy.com Product #41 Silane Penetrating Sealer is a one (1) component sealer that provides excellent protection to concrete against attack from wet/dry, freeze/ thaw cycles, and de-icing chemicals. Epoxy.com Product #41 Silane Penetrating Sealer provides a hydrophobic “water-shedding” effect to masonry surfaces. Epoxy.com Product #41 Silane Penetrating Sealer is a penetrating sealer that is repellent to liquid water but permeable to water vapor: a “breathable” coating. Epoxy.com Product #63 EVA Expansion Joint – a water-tight cross-linked closed-cell Ethylene Vinyl Acetate expanded foam material that exhibits unique properties when used in expansion contraction joints. Epoxy.com Product #63 EVA Expansion Joint is a water-tight cross-linked closed-cell Ethylene Vinyl Acetate expanded foam material that exhibits unique properties when used in expansion contraction joints. Epoxy.com Product #63 EVA Expansion Joint is water-tight and exhibits good chemical resistance properties to most mild non-oxidizing acids, alkalines and petroleum products. Epoxy.com Product #66 Round Quartz Colored Fine – a pure silica sand as the basic mineral. Silica is an extremely hard abrasion resistant and chemically inert mineral, ideal for use in conditions that – at times – may be severe. Flooring surfaces produced with high density silica combined with Industrial Flooring Resins produced by us consistently show greater resistance to wear than surfaces filled with minerals or many other resins or binders. Epoxy.com Product #67 Rounded Quartz Colored Medium Aggregates – Similar to Product #66, but larger. Epoxy.com Product #71 Fumed Silica Thixotropic Agentlly graded natural silica aggregate.Epoxy.com Product #75 Silica Filler is oven dried just prior to packaging, this makes it suitable for use in epoxy grouts. When mixed with Epoxy.com products, Epoxy.com Product #75 Silica Filler makes excellent high strength products . Epoxy.com Product #76 Epoxy Extender is a blend of specially selected oven dried aggregates. Careful blending assures the utmost in proportioning to produce the best flow when mixed with Epoxy.com epoxy and resinous polymeric systems. Epoxy.com Product #76 Epoxy Extender is gray in color. Epoxy.com Product #78 Self Leveling Filler – is a specially graded blend of fine dry silica sands, designed as a self leveling filler for Epoxy.com 100%Solids Epoxy Mortar Products. It is dried before bagging. Epoxy.com Product #78 Self Leveling Filler works best when being used with a low viscosity resin like Epoxy.com Product #10, Product #24 and Product #28. The amount of Epoxy.com Product #78 Self Leveling Filler that you add can be varied for the application. Epoxy.com Product #80 Acrylic Sealer– a clear acrylic solution formulated to create a clear, non-yellowing protective coating. Epoxy.com Product #80 Acrylic Sealer provides a tough, UV and abrasion resistant film that effectively protects surfaces from moisture penetration, staining, dirt, dust, and wear. Providing a surface that is easy to clean and maintain, Epoxy.com Product #80 Acrylic Sealer is an excellent choice for both interior and exterior applications. Epoxy.com Product #81 Epoxy Gel Extender is a specially formulated blend of fine granules and plasticizers for use with trowelable (thixotropic) epoxy materials. Epoxy.com System #83 Vinyl Ester – use in a wide range of industrial applications. Epoxy.com System #83 Vinyl Ester can be installed as a coating, slurry, or mortar to meet various chemical and heat resistance needs. Epoxy.com Product #84 Universal Primer – Used for Epoxy.com System #83 and many other Epoxy.com Products. Epoxy.com Product #100 Anti-Moisture Entrapment System is now available in its new and improved formulation, now know as Epoxy.com Product #100MR Anti-Moisture Entrapment System . Epoxy.com Product #101 Epoxy Body Coat is an epoxy coating for commercial and light industrial floors. Epoxy.com Product #101 Epoxy Body Coat is designed for slurry and self-leveling epoxy flooring applications. Epoxy.com Product #101 Epoxy Body Coat helps to smooth seamless epoxy floors that are to receive Epoxy.com Seamless Epoxy Flooring and Epoxy.com Seamless Epoxy Coating (paint) systems. Epoxy.com Product #101 Epoxy Body Coat provides an extra thickness to protect the substrate from chemical attack. Epoxy.com Product #101 Epoxy Body Coat protects the substrate from impact and adds additional abrasion resistance to Epoxy.com Seamless Epoxy Flooring and Epoxy.com Seamless Epoxy Coating (paint) systems. Epoxy.com Product #115 Epoxy Systems for Modifying Concrete is for modifying concrete is a two component, 2:1 ratio, 100% solids, liquid epoxy resin system. It can be added to conventional concrete or mortar mixes to produce high strength, epoxy modified concrete or mortar mix. Epoxy.com Product #115 Part “C” powder additive for Product #115 Epoxy Systems for Modifying Concrete – to insure ultimate strength. Epoxy.com Product #120 Modified Concrete Admixture is a modified latex liquid admixture to improve the bond of Portland cement concrete toppings, thin-sets, patches, leveling courses, slush coats, stucco; and to improve the “hang” of vertically applied flash coats. Epoxy.com Product #150 Polyester Grout is a three component, flowable, fast-setting, 100% reactive polyester grout specifically formulated for anchor bolt setting. Epoxy.com Product #150 Polyester Grout may also be used as a grout for floor topping where chemical resistance is required. Epoxy.com Product #203 Cold Temperature Cure Polymeric Primer – is often used in coolers and food preparation areas that require constant low temperatures. It is frequently used in room temperature applications to meet super-fast cure, limited shutdown needs. Epoxy.com Product #204 Cold Temperature Cure Polymeric Coating – is a specially formulated coating for cold temperature applications. Able to cure at temperatures as low as 35°F. It is often used in coolers and food preparation areas that require constant low temperatures. It is also frequently used in room temperature applications to meet super-fast cure, limited shutdown needs. Epoxy.com Product #206 Cold Temperature Cure Pigmented Polymeric Flooring Resin is a specially formulated binder for cold temperature applications. Able to cure at temperatures as low as 35°F. It is often used in coolers and food preparation areas that require constant low temperatures. Epoxy.com Product #206 Cold Temperature Cure Pigmented Polymeric Flooring Resin is also frequently used in room temperature applications to meet super-fast cure, limited shutdown needs. Is available in clear or colors. Epoxy.com Product #210 Coal Tar Epoxy is a two component, 100% Solids coating especially formulated for high build applications. It produces a tough, flexible, chemical and impact resistant film. Epoxy.com Product #210 Coal Tar Epoxy is formulated to be easily spray applied as thick as 40 mils in 1 coat. It provides excellent resistance to aggressive water, acids, and caustics. Suitable for intermittent exposure to 300° F.
Epoxy.com Product #211 Polyamide Epoxy Coating – Ideal for bonding to steel and similar surfaces – Special order only with larger minimum quantities. Epoxy.com Product #213 Decoupage Epoxy is a two component, 100% solids, epoxy resin system. When mixed at a 1:1 ratio, Epoxy.com Product #213 Decoupage Epoxy provides a decoupage grade epoxy surface for wood products. Epoxy.com Product #213 Decoupage Epoxy gives a beautiful elegant mar resistant surface that will enhance the look and value of wood for years to come. Epoxy.com Product #215 Epoxy Polyamine epoxy-polyamide combination, is no longer VOC compliant. Use Epoxy.com 215LVOC instead. Epoxy.com Product # 215LVOC (Low Volatile Organic Content) Epoxy Protective Coating is a two-component, high solids epoxy coating. The material components are Epoxy and high performance polyamide with corrosion inhibitors. It is 100 % reactive. It has a convenient 1:1 mixing ratio by volume and a long pot life to simplify mixing and application. Epoxy.com Product #216 Coal Tar Epoxy is a two component coal tar epoxy coating, black in color, used to protect steel, concrete structures, timber, and other construction materials in corrosive environments. It meets all requirements of Corp. of Engineers C-200, Federal Specification DOD-P-23236 (SHIPS), and SSPC 16-91. Epoxy.com Product #220 Rebar Touch Up Epoxy Coating is a two component, 70% solids epoxy coating specially manufactured to touch up damage epoxy coated rebar or to coat rebars not previously protected against corrosion. Epoxy.com Product #222 Water Based Epoxy Coating– is a two component 100% reactive water based multifunctional epoxy resin coating. Epoxy.com Product #222 is manufactured to produce the utmost in performance in a safe, water borne coating. Epoxy.com Product #222 Water Based Epoxy Coating provides excellent resistance to salt intrusion, and excellent adhesion to most common construction substrates. Epoxy.com Product #223 Clear Water Based Epoxy Curing Compound, Sealer and Bonding Agent is a two component water based epoxy curing that is used to both cure and seal concrete and to bond freshly placed concrete to existing concrete. It is ideally suited as a cure and seal for freshly placed concrete. Its chemical resistance makes it ideal to seal: stamped concrete, acid stained concrete, concrete countertops, parapet walls, bridge pier caps, sealing floors in food processing areas, or any other area that requires a durable, chemical resistant concrete sealer. Epoxy.com Product #225 Water Cleanable Epoxy Mortar Kit – includes Epoxy.com Product #224 along with the aggregate. Mix the three components together for a ready to use system. Epoxy.com Product #226 Fast Setting Water Based Epoxy is a Fast Setting Water Based Epoxy Coating is a two component, 100% reactive, water based, multi functional epoxy resin coating. Epoxy.com Product #226 Fast Setting Water Based Epoxy is manufactured to produce the utmost in performance in a safe, water borne coating. Epoxy.com Product #226 Fast Setting Water Based Epoxy provides excellent resistance to salt intrusion, and excellent adhesion to most common construction substrates. Epoxy.com Product #226 Fast Setting Water Based Epoxy is VOC Compliant, Fast Curing, and tintable with standard colorants. It is Internally Flexibilized so it can be applied to metals and plastics. It is water-reducible and easily applied. Special order item only. Requires a minimum quantity. Contact Epoxy.com Tech Support for details. Epoxy.com Product #231 – Water Emulsion Primer and Sealer is a water based epoxy primer/sealer designed to have maximum resin penetration into concrete surfaces to provide high bond strength and adhesion. Epoxy.com Product #231 Water Emulsion Primer and Sealer has very low odor and, therefore, can be used in occupied areas. Epoxy.com Product #231 Water Emulsion Primer and Sealer has the ability to be applied to recently poured (green) concrete and achieve excellent adhesion. Epoxy.com Product #231 Water Emulsion Primer and Sealer is ideal for both new and old concrete surfaces. It is used as a primer for Epoxy.com High Build and Thin Film Coating Systems. Epoxy.com Product #241 Low VOC Acrylic Sealer is a clear acrylic emulsion formulated to create a clear, non-yellowing, protective coating. Epoxy.com Product #241 Acrylic Sealer with Low VOCs provides a tough, UV, and abrasion resistant film that protects surfaces from moisture penetration, staining, dirt, dust, wear, and provides a surface that is easy to clean and maintain. Epoxy.com Product #241 Acrylic Sealer is an excellent choice for both interior and exterior applications. Epoxy.com Product #250 Non-Potable Water Tank Coating is a 100% solids, moisture- insensitive epoxy coating, containing no solvents. It is mixed at a 2:1 ratio, produces a tough, chemical and abrasion-resistant coating for dry or damp concrete, wood or steel surfaces. Epoxy.com Product #255 Mastic High Build Epoxy Coating is a 100% solids, moisture-insensitive, epoxy resin system. When mixed at a 1:1 ratio, by volume, it produces an excellent coating for dry or damp concrete, wood or steel surfaces. It iss used on piles, piers, and concrete or steel tanks where concrete or steel needs to be protected from abrasive environments. Epoxy.com Product #260 Corrosion Resistant Epoxy Protective Primer and Coating are two-component, 100% solids epoxy coatings based on multi-functional high performance resin and anti-corrosive pigment. Epoxy.com Product #260 Primer and Coating is used as a two coat system. Epoxy.com Product #260 Corrosion Resistant Epoxy Protective Primer and Coating provides corrosion resistant protection to steel and other metals. Epoxy.com Product #260 Corrosion Resistant Primer and Coating has excellent resistance to chemicals up to 300°F, and hot water resistance at temperatures up to 250°F under continuous immersion. Epoxy.com Epoxy.com Product #260 Corrosion Resistant Epoxy Protective Primer and Coating is formulated in a convenient 2 to 1 ratio, by volume mix ratio and has a long pot life to simplify application. The primer is green and the topcoat is blue. (Other colors are available as special order product.) Epoxy.com Product #260 Corrosion Resistant Epoxy Protective Primer and Coating is particularly effective in applications which entail force curing, either as pre-immersion or during immersion service. Epoxy.com Product #301 Injection Resin, low Modulus – a 100% solids low viscosity epoxy adhesive used to restore cracked structural concrete by the pressure injection method and to grout cracks in a horizontal plane by gravity. Epoxy.com Product #302 Injection a 100% solids low viscosity moisture insensitive epoxy adhesive used to restore cracked structural concrete by the pressure injection method and to grout cracks in a horizontal plane by gravity. Epoxy.com Product #303 Low Viscosity Epoxy Injection Resin a is a two component, 100% solids, moisture insensitive epoxy resin system, mixed at a 2:1 ratio, with a viscosity of light-weight oil. Product #303 exceeds the requirements of ASTM C 881-87, Types I, II, Grade 1, Class “B” and “C”. Use neat for grouting damp and dry cracks or as a penetrating sealer on concrete, and wood. May also be mixed with Special Fillers (Products #72-75), to create epoxy mortars. Epoxy.com Product #304 Injection Resin and Mortar Binder is a moisture insensitive, two-component, 100% solids epoxy resin system designed specifically for use in temperatures of 40°F and below. It is recommended for injection or anchor-bolt grouting in the neat state or as a mortar when mixed with up to 3 1/4 parts of Epoxy.com Product #75 Filler (by volume). Epoxy.com Product #304 Injection Resin and Mortar Binder exceeds requirements of ASTM C-881-90, Types I, Grade 1, Class A.
Epoxy.com Product #307 Low Viscosity Epoxy Injection Resin and Mortar Binder is an Ultra-Low Viscosity Epoxy Resin System is a two component, 100% solids, moisture insensitive epoxy resin system, mixed at a 2 to 1 ratio, with a very low viscosity for penetrating cracks. Epoxy.com Product #307 Ultra-Low Viscosity Epoxy Resin Systems exceeds the requirements of ASTM C 881 87, Types I, II, Grade 1, Class “B” and “C”. Epoxy.com Product #308 Ultra Low Viscosity Injection Resin for Load Bearing Applications is an Ultra-Low Viscosity Epoxy Resin System for use as epoxy injection or low viscosity epoxy mortar resin. It is 100% solids and is mixed 2:1 by volume. Meets or exceeds the requirements for ASTM C881 Types I and IV, Grade 1, Classes B &C.
Epoxy.com Product #312 Aliphatic Sprayable Polyurea Coating is a two component sprayable aliphatic polyurea. It dries in seconds to provide a tough chemical and abrasion resistant coating. As an aliphatic polyurea, Epoxy.com Product #312 Aliphatic Sprayable Polyurea Coating is color fast and will resist yellowing from Ultra violet light exposure. Typical working times of one minute or less can be expected. This fast reaction requires a fast, efficient mixing technique so that the mixture can be applied within the short gel times. Impingement mixing from available two-component spray machinery is efficient and entirely adequate. Epoxy.com Product #315 Chip Flooring Product #315 is a seamless, plural component, liquid applied, 100% solids polymeric colored flake floor resurfacing system with superior wear, and chemical resistance. Product #315 with “multi-colored” flakes produces a durable, easy to maintain floor, on both new and old surfaces. Epoxy.com Product #315BC Polymeric Coating and Base Coat for the 315Chip Flooring System. It can also be used as a stand alone coating. If Epoxy.com Product #315BC is used as a stand alone coating over concrete, it is recommended that you first prime with Product #899 Primer. Epoxy.com Product #315BC – Fast Same as Product #315BCPolymeric Coating for Base Coat for the 315Chip Flooring System, but with a fast cure. Epoxy.com Product #315BC-Cold Similar to Product #315BC Polymeric Coating for Base Coat for the 315Chip Flooring System, but with a cold temperature cure. Epoxy.com #315NH Epoxy Floor Coating is a 100%solids, moisture-insensitive epoxy coating. Epoxy.com #315NH Epoxy Floor Coating mixed at 2 :1 by volume ratio, produces an excellent coating for dry or damp concrete, wood, or steel surfaces.Epoxy.com #315NH Epoxy Floor Coating is available in a summer grade and winter grade formulation. It can be used as a stand alone coating or as a base coat for Epoxy.com Chip Flooring System. It can also be used to replace Epoxy.com Product #315BC Polymeric Coating when a non-hazmat to ship basecoat is required. Epoxy.com Product #316 Fast Set Flooring – a 100 % solids fast setting two-component epoxy resin system. Is made to set fast even in temperatures below freezing. It is recommended for flooring, injection or anchor-bolt grouting in the neat state or as a mortar when mixed Epoxy.com Product #75 Filler. It exceeds most requirements of ASTM C-881-99, Types I and IV , Grade 1, Class A.
Epoxy.com Product #402 – 2 Component Chemical Resistant Coating – is a two cmponent chemical resistant polyurethane coating with gloss finish offers excellent abrasion resistance, chemical and stain resistance, and color retention. Epoxy.com Product #402 – 2 Component Chemical Resistant Coating can be used equally well on vertical or horizontal surfaces. It is ideal for concrete floors and walls in warehouses, storage facilities, aircraft hangers, animal housing, and vehicle maintenance facilities. Product is not for use in California Use Product #406 – Two Component Low VOC Chemical Resistant Urethane Coating when a California Compliant low VOC product is required, or desired. Epoxy.com Product #406 – Two Component Low VOC Chemical Resistant Urethane Coating – is a low VOC compliant urethane that meets all federal and state environmental air quality standards. The high gloss finish offers excellent abrasion resistance, chemical and stain resistance, and superior color retention.Epoxy.com Product #406 – Two Component Low VOC Chemical Resistant Urethane Coating can be used equally well on vertical or horizontal surfaces. It is ideal for concrete floors and walls in warehouses, storage facilities, aircraft hangars, animal housing, and vehicle maintenance facilities. 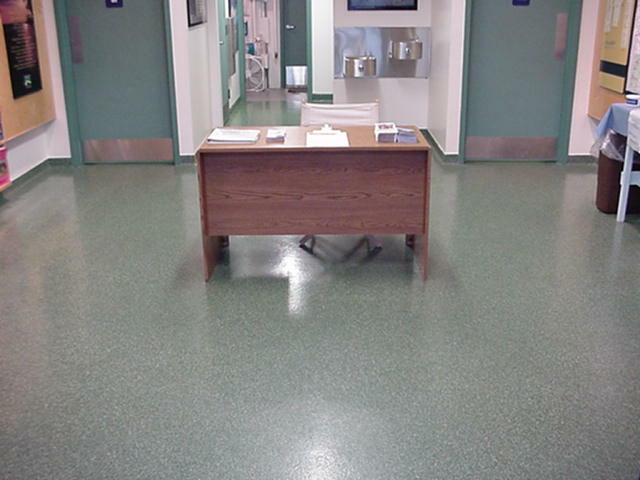 Available in both clear and pigmented formulations, Epoxy.com Product #406 – Two Component Low VOC Chemical Resistant Urethane Coating can be used as a finish coating option for most Epoxy.com Flooring Systems. Epoxy.com Product #407 Aliphatic Traffic Bearing Membrane is a two component, ultra high solids aliphatic polyurethane elastomeric membrane. When applied, it is resilient and accommodates movement in concrete substrates. Epoxy.com Product #407 Aliphatic Traffic Bearing Membrane is used as a top coat traffic bearing membrane or non-skid coating that retains color and physical properties when exposed to harsh UV conditions. Epoxy.com Product #407 Aliphatic Traffic Bearing Membrane is used as a system with Epoxy.com Product #882 Concrete Membrane Deck Primer, and may be applied as the top coat on Epoxy.com Product #409 Traffic Bearing Membrane to maximize cost effectiveness. Epoxy.com Product #407 Aliphatic Traffic Bearing Membrane cures at ambient temperatures and is impermeable to moisture, oils, mild acids, gasoline, and alkalies. Epoxy.com Product #409 Traffic Bearing Membrane is a Resilient Traffic Bearing Membrane. It is a 100% solids, ambient cure impermeable elastomer. Epoxy.com Product #409 Traffic Bearing Membrane is resistant to moisture, oils, mild acids, gasoline, and alkalies. Epoxy.com Product #409 Traffic Bearing Membrane when applied to concrete or other surfaces, is resilient and accommodates movement in concrete substrates. Epoxy.com Product #409 Traffic Bearing Membrane is used as a traffic bearing membrane or non-skid coating that retains color and physical properties when exposed to harsh UV conditions. Product #420 Urethane Injection for Moisture. It reacts with water and expands to form an impermeable HYDROPHOBIC barrier. When reacted and hardened, Product #420 Urethane Injection for Moisture. is insoluble to water and other aggressive chemicals. Epoxy Product #424 is a rigid two component closed cell foam impervious to water and moisture. It can be used where structural foam is needed to encapsulate waste or restore the physical properties of timber and other masonry materials. Epoxy.com Product #425 is a two component, HCFC-141b/water co-blown rigid polyurethane foam system designed for low-density insulation applications. Epoxy.com Product #425 Urethane Floatation Foam is typically used for floatation (Boat Foam) inside fiberglass parts. It bonds well to metals, wood and some plastics. This foam system meets Military Specification P-21929B. Epoxy.com Product #429 Urethane Injection Resin Accelerator is specifically formulated to increase the cure rate of Epoxy.com Product #4 Urethane Injection Resin. The accelerator liquid is normally used to compensate for cold weather or cold water temperatures. Epoxy.com Product #431 Structural Foam with Flame Retardant is a two component, flame retardant foam especially manufactured to provide a rigid foam with physical properties similar to that of timber or cement grouts, at a convenient one to one ratio, A to B, light black in color. Epoxy.com Product #431 Structural Foam with Flame Retardant will bond to wet, moist or dry surfaces, even to Plexiglas, with no shrinkage and ample pot life after mixing A & B components. As of the day of this page being published a 30 gallon minimum for this product is required. Epoxy.com Product # 441 Urethane Coating and Sealing Resin is a two component water-based aliphatic (non-yellowing) polyurethane. It is free of the health and environmental problems normally found in solvent-based urethanes, while maintaining excellent performance properties. Epoxy.com Product # 441 Urethane Coating and Sealing Resin provides a matte finish. Epoxy.com Product # 441 Urethane Coating and Sealing Resin has good chemical, stain, and mar resistance. In addition, it is easy to clean and has excellent color retention under heavy foot traffic. It is a high performance coating for use in a variety of seamless floor and wall coating systems. Epoxy.com Product # 441 Urethane Coating and Sealing Resin eliminates the strong solvent odor normally associated with many high performance materials. It is ideal for topcoats and finishes that require high abrasion resistance. Typical application areas are clean rooms, hospitals, pharmaceutical facilities, stained concrete, wood floors, and as a seal coat for most Epoxy.com floor and wall coating systems. Epoxy.com Product #447 Waterproofing Membrane is a latex-based liquid membrane. Epoxy.com Product #447 offers a non-toxic, one part flexible solution for a wide range of waterproofing and vapor-proofing applications. Epoxy.com Product #449 Elastomeric Polyurethane Membrane Waterproofing is a two-component, modified elastomeric material. After mixing and curing it forms a tough, flexible waterproof membrane. Epoxy.com #449 Elastomeric Polyurethane Membrane Waterproofing Membrane is applied to horizontal surfaces of concrete, steel or wood to prevent penetration of moisture and other deleterious substances. Typical applications are between slab waterproofing above and below grade. Epoxy.com Product #459 is a two component, high solids, elastomeric urethane used in waterproofing applications.Epoxy.com Product #459 exhibits excellent elongation properties along with high tensile strength and tear resistance to make it an ideal crack resistant membrane for use under other Epoxy.com flooring systems. Epoxy.com Product #459 is also used with Epoxy.com Elastomeric Systems. Epoxy.com Product #467 Urethane Top Coating – is a single component aliphatic urethane topcoat used to seal Epoxy.com Elastomeric Urethane Decking Systems. Exhibiting excellent resistance to ultraviolet degradation, Epoxy.com Product #467 Urethane Top Coating provides a high-build, chemically resistant finish. Epoxy.com Product #488 UV Stable Aliphatic Polyurethane Coating is a two component, ultra high solids, aliphatic polyurethane designed to provide high gloss, UV stable (non-yellowing) and chemical resistant protection. Epoxy.com Product #488 Aliphatic Polyurethane Coating is a superior, new generation product exhibiting fast cure time and excellent stain resistance. Epoxy.com Product #488 Aliphatic Polyurethane Coating has very low odor and can be applied indoors in occupied areas. Epoxy.com Product #488 Aliphatic Polyurethane Coating is generally used as a clear or pigmented high gloss finish Epoxy.com decorative and industrial flooring systems such as Epoxy.com Chip Flooring (garage floor finish). Epoxy.com System #495 Elastomeric Polyurethane Traffic Membrane System– is an Elastomeric Urethane Membrane System, that is liquid applied. Epoxy.com System #495 Elastomeric Polyurethane Traffic Membrane System is seamless, elastomeric (flexible), and UV. Thee qualities make it an excellent choice for outside applications in direct sun and weather, where water tightness, durability, and excellent appearance is required. Its elastomeric properties will allow horizontal movements up to 1/8 inch without breaking. Epoxy.com System #495 Elastomeric Polyurethane Traffic Membrane System has excellent abrasion and chemical resistance. The surface of Epoxy.com System #495 Elastomeric Polyurethane Traffic Membrane System can be varied to achieve the required anti-skid and decorative look. Epoxy.com Product #500 Polyester Wood Filler Pine is a two component, wood like polyester filler paste. Quick setting and easy to use. Epoxy.com Product #500 Polyester Wood Filler Pine is designed primarily for wood repairs in construction surfaces. Can be used to fill areas of deteriorated concrete (or holes). Also used by model shops for making permanent repairs, fillets, and design changes in the construction of all wood models and patterns. Epoxy.com Product #500 Polyester Wood Filler Pine has excellent adhesion to wood, fiberglass, and plaster and can be worked with standard woodworking tools in a quick and convenient manner. Epoxy.com Product #501 Polyester Wood Filler Mahogany is a two component, wood like polyester filler paste. Quick setting and easy to use. Epoxy.com Product #501 Polyester Wood Filler Mahogany is designed primarily for wood repairs in construction surfaces. Can be used to fill areas of deteriorated concrete (or holes). Also used by model shops for making permanent repairs, fillets, and design changes in the construction of all wood models and patterns. Epoxy.com Product #501 Polyester Wood Filler Mahogany has excellent adhesion to wood, fiberglass, and plaster and can be worked with standard woodworking tools in a quick and convenient manner. Epoxy.com Product #502 Polyester Wood Filler Hardener 1 oz. Epoxy.com Product #503 Polyester Wood Filler Hardener 4 oz. Epoxy.com Product #504 Polyester Paste Gray is a fast-setting industrial filler paste used for manufacturing, fabrication and repair in aircraft, aerospace and other industries having requirements for above normal temperature exposure. Fast and permanent applications are achieved by Epoxy.com Product #504 Polyester Paste Gray. The service temperature of Epoxy.com Product #504 Polyester Paste Gray is up to 400 degrees F (205 degrees C). It is used in the construction industry to seal cracks for injection and for patches used on concrete, wood, steel and other suitable construction materials. Excellent machining and finishing results are accomplished by grinding, sanding, scraping, etc. When exposed to elevated temperatures, Epoxy.com Product #504 Polyester Paste Grayhas a tendency to darken but does not gas, bubble, or cause any finish distortion. This product does not contain wax and readily bonds to itself and other substrates such as FRP/SMC, hi-temp epoxy molds, aluminum, steel, cast iron, urethane foam parts, etc. Epoxy.com Product #504 Polyester Paste Gray is non-metallic, non-conductive, and non-sparking. Epoxy.com Product #505 Polyester Paste Black is a fast-setting industrial filler paste used for manufacturing, fabrication and repair in aircraft, aerospace and other industries having requirements for above normal temperature exposure. Fast and permanent applications are achieved by Epoxy.com Product #505 Polyester Paste Black. The service temperature of Epoxy.com Product #505 Polyester Paste Black is up to 400° F (205 ° C). It is used in the construction industry to seal cracks for injection and for patches used on concrete, wood, steel and other suitable construction materials. Excellent machining and finishing results are accomplished by grinding, sanding, scraping, etc. When exposed to elevated temperatures, Epoxy.com Epoxy.com Product #505 Polyester Paste Black has a tendency to darken but does not gas, bubble, or cause any finish distortion. This product does not contain wax and readily bonds to itself and other substrates such as FRP/SMC, hi-temp epoxy molds, aluminum, steel, cast iron, urethane foam parts, etc. Epoxy.com Product #505 Polyester Paste Blac is non-metallic, non-conductive, and non-sparking. Epoxy.com Product #600 Flexible Novolac is a two-component, 100% solids epoxy coating based on multi-functional high performance flexibilized resin. Epoxy.com Product #600 Flexible Novolac provides corrosion resistant protection to steel, other metals and concrete. It has excellent resistance to chemicals up to 300°F. It is resistant to continuous immersion in water up to 212°F. Epoxy.com Product #600 Flexible Novolac is formulated in a convenient 1 to 1 ratio, by volume mix ratio and has a long pot life to simplify application. Epoxy.com Product #600 Flexible Novolac is more effective in applications which entail force curing. Epoxy.com Product #629 Chemical Resistant Conductive Flooring is a 100% solids epoxy Novolac Conductive coating ideal for severe chemical and solvent storage requiring conductive and spark proof surfaces. Applied at a nominal 1/16 inch, the Epoxy.com Product #629 Chemical Resistant Conductive Flooring offers the superior chemical resistance of a Novolac Resin System while maintaining a conductive surface. Epoxy.com Product #630 Novolac Coating/Mortar Binder – a 100% solids epoxy Novolac ideal for harsh chemical and solvent resistant applications. It is ideal for use as a troweled mortar, slurry binder, and coating for concrete and steel in extremely corrosive areas where resistance to 98% sulfuric acid or other strong caustics is needed. Epoxy.com Product #630 Novolac Coating/Mortar Binder is ideal for use as a protective coating for concrete and steel in the extremely corrosive areas of chemical plants and pulp mills secondary containment areas, water and waste treatment, and gas and electric utilities. Epoxy.com Product #631 – Chemical Resistant Coating has been developed as a coating for exposure to organic acids and other severe chemical environments. It is used widely in the food and chemical industries for protection of concrete, wood, and steel. Epoxy.com PRODUCT #631 is suitable for application by brush, roller or spray. Where in-shop production techniques may be utilized and elevated temperature curing is feasible, rapid property development may be achieved by curing at 200° – 250°F (93° – 121°C). This will provide a cured film which may be handled within a relatively short period of time (about 4 hours). Elevated temperature curing will also enhance ultimate physical and chemical resistant properties. Epoxy.com Product #632 Novolac Control Joint Filler is a 100% solids flexible Novolac epoxy Chemical Resistant joint filler for saw-cut joints of concrete slabs on grade. Epoxy.com Product #633 Novolac Coating is a 100% solids epoxy Novolac coating ideal for harsh chemical and solvent resistant applications. It is used in secondary containment, solven storage, pump pads, trenches, and other high exposure areas. It is ideal for use as a protective coating for concrete and steel in the extremely corrosive areas of chemical plants and pulp mills secondary containment areas, water and waste treatment, and gas and electric utilities. Epoxy.com Product #633 Novolac Coating is commonly used as a seal coat for Epoxy.com MORTAR SYSTEMS where chemical resistant performance is required. Epoxy.com Product #634 Novolac High Temperature Epoxy – is a 100% solids amine cured epoxy Novolac that is solvent free. Suitable for immersion and non-immersion service particularly in aggressive acid and alkali environments with elevated temperatures.Epoxy.com Product #634 Novolac High Temperature Epoxy produces a tough, chemical resistant coating on concrete, iron and non-iron surfaces. As a low viscosity epoxy Novolac it is suitable for hand or spray application. Epoxy.com Product #636 High Temp Chemical Resistant Primer/Topcoat – a 100% solids amine cured epoxy Novolac that is solvent free. Epoxy.com Product #636 High Temp Chemical Resistant Primer/Topcoat is Specifically designed as a Methanol resistant coating. Epoxy.com Product #636 High Temp Chemical Resistant Primer/Topcoat is well suited for use in a wide array of aggressive acids, alkalies and organic solvents. It produces a tough, chemical resistant coating on concrete, iron and non-iron surfaces. As a low viscosity epoxy Novolac it is suitable for hand or spray application. Epoxy.com Product #637 High Temp Coating/Primeris a 100% solids amine cured epoxy Novolac that is solvent free. Suitable for immersion and non-immersion service particularly in aggressive acid environments. Epoxy.com Product #637 High Temp Coating/Primer produces a tough, chemical resistant coating on concrete, iron and non-iron surfaces. As a lower viscosity epoxy Novolac it is suitable as a primer or as a top coating. Excellent against 98% Sulfuric Acid. Epoxy.com Product #640 Chemical & Heat Resistance is a two component; 100% solids brush, roll or airless spray applied coating designed to provide cavitation, corrosion and erosion resistance to concrete, metallic and nonmetallic surfaces. Epoxy.com Product #640 Chemical & Heat Resistance acts as an inert barrier against extremely harsh environmental factors such as low and high PH, temperature extremes, dry and fluid particulate flow and corrosive chemical attack. Epoxy.com Product #641 High Temperature Epoxy is a moisture-insensitive, two-component, 100% solids epoxy coating. It is especially formulated to protect concrete, steel and wood subject to high temperatures and corrosion. Product #641LV High Temperature Resistant Epoxy Mortar Resin is a two component highly cross-linked Novolac epoxy resin system. It is especially formulated to be used as a high temperature grouting or laminating resin. Epoxy.com Product #641LV High Temperature Resistant Epoxy Mortar Resin is used to protect concrete, steel and other substrates from high temperatures and corrosion. Epoxy.com Product #642 Multifunctional High Chemical Resistance Epoxy Coating/Bonder is a two component, 100% solids, one coat trowel grade or grout pump applied protective coating designed to provide cavitation, erosion and corrosion resistance to metallic and non-metallic surfaces. Epoxy.com Product #642 Multifunctional High Chemical Resistance Epoxy Coating/Bonder acts as a barrier against extremely harsh environmental factors such as low and high PH, temperatures extremes, dry and fluid particulate flow and corrosive chemical attack. Epoxy.com Product #643 Highly Chemical Resistant Coating is a solvent free, high functionality Novolac epoxy coating suitable for immersion and non-immersion service. Designed specifically as a Methanol resistant coating. Epoxy.com Product #643 Highly Chemical Resistant Coating is well suited for protection in a wide array of aggressive acids, alkalies and organic solvents. It produces a tough, chemical resistant coating on ferrous and non-ferrous metals and concrete. Epoxy.com Product #644 High Temp Chemical Resistant Coating. Similar to Epoxy.com Product #641LV, but with fillers to make it thicker. Epoxy.com Product #646 Heat Resistant Translucent Black Coating is especially formulated to be used as a high temperature grouting or laminating resin. It is also used to protect concrete steel, or other substrates from high temperatures and corrosion. It is similar to Epoxy.com Product #641 but it does not have the pigments that the Epoxy.com Product #641 has. Epoxy.com Product #647 High Temperature Epoxy Coating and High Temperature Epoxy Mortar is a two component highly cross-linked Novolac epoxy resin system. Epoxy.com Product #647 High Temperature Epoxy Coating and High Temperature Epoxy Mortar is especially formulated to be used as a high temperature potting or laminating resin. It is used to protect parts from high temperatures and corrosion. Epoxy.com Product #647 High Temperature Epoxy Coating and High Temperature Epoxy Mortar is 100% solids and has a convenient 2:1 by volume mix ratio and is easy to apply. Epoxy.com Product #648 Chemical Resistant Coating is a two component high performance epoxy resin formulated with a convenient 1 to 1 mix ratio. Epoxy.com Product #648 Chemical Resistant Coating has been developed as a coating for exposure to organic acids and other severe chemical environments. It is used widely in the food and chemical industries for protection of concrete, wood, and steel. Epoxy.com Product #648 Chemical Resistant Coating is suitable for application by brush, roller or spray. Where in-shop production techniques may be utilized and elevated temperature curing is feasible, rapid property development may be achieved by curing at 200° – 250°F (93° – 121°C). This will provide a cured film which may be handled within a relatively short period of time (about 4 hours). Elevated temperature curing will also enhance ultimate physical and chemical resistant properties. Epoxy.com Product #650 Resurfacing Grade Epoxy is a two-component, 100% solids, brushable ceramic, reinforced polymeric compound which has outstanding wear-resistance against abrasion, erosion/corrosion and cavitation in a fluid-flow environment. Epoxy.com Product #651 Ceramic Filled Epoxy Mortar is a two-component, 100% solids, ceramic reinforced, trowelable polymeric compound which can be used to repair virtually any metal surface that has been damaged by erosion/corrosion, cavitation or abrasion. Epoxy.com Product #652 Metal Filled Trowel Grade Epoxy is a two-component, 100% solids, metal-reinforced polymeric compound which can be used to repair virtually any metal surface that has been damaged, cracked or worn. Epoxy.com Product #660 Universal Primer – used as a primer for Epoxy.com Novolac Vinyl Ester and Vinyl Ester Systems. is a one component, moisture cured polyurethane aluminum filled primer and coating. Its low viscosity, high “wetting” characteristics, and creep, undercutting, and blistering resistance make Epoxy.com Product #660 Universal Primer and Finish a superior primer and finish coat. Epoxy.com Product #660 Universal Primer and Finish undergoes a rapid molecular weight change as it polymerizes into a high molecular weight finish with excellent corrosion and abrasion resistance. Epoxy.com Product #661 Vinyl Ester Binder Adhesive is a clear, 100% reactive, vinyl ester novolac used to coat or line concrete or steel surfaces in chemically aggressive industrial environments. It is used for coating primary and secondary containment, trenches, troughs, pump pads, and equipment. Epoxy.com Product #663 Vinyl Ester Coating is a 100% reactive, vinyl ester novolac used to coat concrete or steel surfaces in chemically aggressive industrial environments. Due to its high molecular weight and low permeability, it will withstand exposure to bond range of acids, caustiec and solvents. It is designed as a coating for secondary containment, trenches, troughs, pump pads, equipment and structural members. Low Temperature accelerators are available for positive cure at temperatures down as low as 33° F.
Epoxy.com Product #671 Conductive Primer/Sealer is a low viscosity, two component, carbon filled, polyamide modified conductive primer/sealer formulated with special wetting agents to provide maximum penetration into concrete surfaces. Epoxy.com Product #671 Conductive Primer/Sealer is ideal for both new and old concrete surfaces. Epoxy.com Product #671 Conductive Primer/Sealer provides excellent resistance to wear, and can be used either alone or as a conductive sealer or as a conductive primer when used with Epoxy.com product #674 Electro-Static Dissipating Urethane Topcoat and Epoxy.com Conductive Systems. Epoxy.com Product #674 – Electrostatic Dissipative Urethane Coating is a two component, Electrostatic Dissipative chemical resistant, polyurethane coating. The high gloss finish offers excellent abrasion resistance, chemical and stain resistance, and superior color retention. Epoxy.com Product #674 – Electrostatic Dissipative Urethane Coating can be used equally well on vertical or horizontal surfaces. It is ideal for concrete floors and walls in warehouses, storage facilities, aircraft hangars, animal housing, and vehicle maintenance facilities. Available in both clear and pigmented formulations, Epoxy.com Product #674 – Electrostatic Dissipative Urethane Coating can be used as a finish coating option for most Epoxy.com Flooring Systems. Epoxy.com Product #675 Electrostatic Dissipating Water Borne Epoxy Topcoat is a pigmented, water emulsion epoxy electro-static dissipative finish designed to have maximum penetration into concrete surfaces to provide high bond strength and adhesion. It has very low odor and can be used in occupied areas as a finish sealer in Thin-Film Electro-Static Dissipative Coating Systems. Epoxy.com Product #677 Electro Static Dissipative (ESD)/ Conductive Coating is a pigmented, water-based epoxy coating designed to achieve either an electro-static dissipative (ESD) finish or conductive finish by modifying the underlying system components and thickness. Epoxy.com Product #677 has very low odor making it suitable for use in occupied buildings and has high bond strength and adhesion to concrete and other surfaces. Epoxy.com Product #680 Methyl Methacrylate (MMA) Polymer Concrete is a Polymer Concrete Methyl Methacrylate (MMA) reactive resin is used as a binder to develop polymer concrete which produces extremely high strength and chemical resistance with an abrasion resistant surface. Epoxy.com Product #680 Methyl Methacrylate (MMA) Polymer Concrete is prepackaged and preproportioned for easy mixing and placing at the job site. The liquid polymer and the preproportioned hardener filler is mixed either in the polyethylene bag or in a mortar mixer. Epoxy.com Product #685 MMA Crack Healer and Sealer is for injection repair or as a penetrating crack repair and sealer on concrete. It is a two component Methyl Methacrylate resin system that polymerizes in place. The extremely low viscosity will penetrate into concrete cracks as fine as 0.003 inches. Epoxy.com Product #691 Methyl Methacrylate (MMA) Primer is a 100% reactive methyl methacrylate primer for all Epoxy.com MMA floor and wall systems. Epoxy.com Product #691 Methyl Methacrylate (MMA) Flooring Primer also provides excellent filling and sealing as a scratch work filler (with filler added) to level uneven floor and wall surfaces. Epoxy.com Product #691 Methyl Methacrylate (MMA) Flooring Primer is a reactive Methacrylate resin, which hardens rapidly with the addition of Epoxy.com Product #695 MMA hardener, even at low temperatures. Epoxy.com Product #692 MMA Membrane is a Flexible Methyl Methacrylate (MMA) Flooring, Decking Bridge Mortar Resin is a higher viscosity, 100% reactive, flexible methyl Methacrylate resin used as a crack isolation or waterproofing membrane under Epoxy.com MMA Systems. Epoxy.com Product #692 Flexible Methyl Methacrylate (MMA) resists cracking caused by horizontal substrate movement providing a crack resistant, resilient surface. Epoxy.com Product #692 Flexible Methyl Methacrylate (MMA) offers stress relieving properties for floor slabs showing movement and/or vibration. Epoxy.com Product #693 MMA Coating is a 100% reactive, medium viscosity methyl methacrylate resin developed as a topcoat for exterior or interior use with Epoxy.com MMA Systems. Epoxy.com Product #695 Methyl Methacrylate (MMA) Coating is semi-flexible for outside use and will not yellow after curing. Its excellent clarity makes it ideal for sealing color quartz and vinyl flake systems. It is excellent for exterior applications such as parking decks, concrete and steel stairs, ramps, and numerous other applications. Epoxy.com Product #697 Methyl Methacrylate (MMA) Binder Resin – a 100% reactive methyl methacrylate binder resin and top coat for self leveling, broadcasting, and troweled mortar systems. Epoxy.com Product #697 Methyl Methacrylate (MMA) Binder Resin is ideal for decorative troweled and broadcast quartz floors and industrial surfacing subject to heavy loads and traffic. Epoxy.com Product #698 Methyl Methacrylate (MMA) Binder Resin is a 100% reactive, low viscosity, flexible methyl methacrylate resin for use as a binder for low resin content troweled mortars and polymer concrete. The resin is ideal for making repairs and to change the slope on floors, bridge decks and joint headers. Epoxy.com Product #699 Low Viscosity Methyl Methacrylate (MMA) Sealer is a 100% reactive, low viscosity methyl methacrylate resin developed as a chemical resistant sealer/topcoat. Epoxy.com Product #699 Low Viscosity Methyl Methacrylate (MMA) Sealer cures to a hard, scratch and wear resistant surface and is specifically designed for dry service in areas subjected to high traffic such as manufacturing areas, aisles, lobbies, service areas, and numerous other applications. Epoxy.com Product #701 Flexible Bonder is a two component, 100% solids, mixedat a 1:1 ratio adhesive formulated to give a permanent bond to ceramic, metal, concrete and elastomeric surfaces. It is thixotropic, non-sag, and is easily applied by trowel. Epoxy.com Product #702 Traffic Marker and Anchor Bolt Adhesive is a two component, 1:1 ratio, 100% solids, moisture insensitive epoxy resin system manufactured to bond delineators and traffic markers to median barriers, parapets, and roadways. It is a normal setting adhesive for use in temperatures above 50° F. Epoxy.com Product #702 Traffic Marker and Anchor Bolt Adhesive will bond to steel, concrete, and asphalt. It exceeds the requirements of AASHTO M237 Type IV. Epoxy.com Product #703 Flexible Gel Adhesive is a non-sagging material that is ideal for repairs on vertical or overhead surfaces. It exceeds the requirements of ASTM C 881-87, Types I, II, and III Grade 3, Class “B”, “C”, “E” and “F”. Epoxy.com Product #704 Emergency Epoxy is a rapid setting, two component, 1:1 ratio epoxy adhesive. It sets in six minutes and can be put into service in one hour regardless of temperature. It was designed to bond metals, glass, concrete and wood in a matter of minutes. Epoxy.com Product #706 Heat Resistant Bonder/Mortar is a 100% solids, moisture insensitive epoxy adhesive and repair material. When A and B Components are mixed they produce a gel consistency similar to petroleum jelly, which will not sag or run on a vertical or overhead surface application. Epoxy.com Product #707 Splash Zone & Under Water Epoxy Paste is a moisture-insensitive, two-component, 100% solids epoxy-resin system. When Product #707 Splash Zone & Under Water Epoxy is mixed at a 1:1 ratio, by volume, this product produces a paste-like material that is ideal for protection or restoration of concrete, steel and timber piles and other structural elements in marine environments. Epoxy.com Product #711 is protective coating designed to provide cavitation, erosion and corrosion resistance to metallic and non-metallic surfaces. Epoxy.com Product #711 acts as a barrier against extremely harsh environmental factors such as low and high PH, temperatures extremes, dry and fluid particulate flow and corrosive chemical attack. Epoxy.com Product #714 Precast Segmental Adhesive is a 100% solids, gelled epoxy adhesive formulated to the requirements of ASTM C-881-90, Type VI, Grade 3, Class D, E, or F. AASHTO M-235-90 duplicates the technical requirements of ASTM -C-881-90. Epoxy.com Product #720 Cove Base Binder – can be used to install an integral cove base for most Epoxy.com Flooring Systems, to provide seamless wall to floor protection. Epoxy.com Product #810 Primer for Polyurea is a two-component, clear, VOC compliant floor coating. Epoxy.com Product #810 Primer for Polyurea is fast drying and will cure in temperatures as low as 35°F. Its convenient 2A:1B mixing ratio, no induction time and long pot life simplify mixing and application. Epoxy.com Product #810 Primer for Polyurea protects by penetrating concrete or woodand has excellent adhesion to damp concrete, it is an excellent concrete primer. Epoxy.com Product #825 Epoxy Floor Sealer is a non-rewettable, polymer emulsion formulated for use with fast or normal setting floor underlayment. Product #844 Concrete Membrane Deck Primer is a 100% solids, two (2) component polyurethane primer. This thin film primer promotes long term wear and superior adhesion of the Epoxy.com Product #409 Resilient Traffic Bearing Membrane. The Epoxy.com Product #844 Concrete Membrane Deck Primer penetrates and seals the surface to allow for a smoother, pinhole free application. Epoxy.com Product # 845 Penetrant & Prime Coat is a 100 % solids, low viscosity, epoxy primer for use on steel, concrete or wood. The low viscosity and special adhesion promoters make it an excellent penetrant of rusted steel or concrete. Epoxy.com Product #844 Concrete Membrane Deck Primer acts as an inert barrier, resistant to impact, acids, caustics, solvent and thermal shock. The tough water proof surface is excellent for subsequent coatings. Epoxy.com Product 870 – 65% Solids – Penetrating Epoxy Sealer is a two-component penetrating epoxy sealer (with very high solids) designed for superior protection of new concrete or for prolonging the serviceability of partially-deteriorated concrete. The sealer is a low to medium viscosity material and is capable of providing an effective membrane barrier to inhibit moisture migration and corrosive chemical penetration. In the cured state Epoxy.com Product 870 – 65% Solids – Penetrating Epoxy Sealer allows moisture vapor transmission; it seals off moisture entry but still allows the concrete to breath. When applied to concrete placed and finished in accordance with standards defined in ACI 201 (Guide to Durable Concrete), Epoxy.com Product 870 – 65% Solids Penetrating Epoxy Sealer) greatly improves wear resistance of the concrete surface, slows down the corrosion of reinforcing steel and adds many years’ life to the structure. Epoxy.com Product 870 – 65% Solids Penetrating Epoxy Sealer) has a solids content of over 65% after curing. It may be applied to dry surfaces at temperatures of 40°F or above. Epoxy.com Product #882 Concrete Primer Concrete Membrane Deck Primer is a 100% solids, two (2) component polyurethane primer. This thin film primer promotes long term wear and superior adhesion of the Epoxy.com Product #882 Concrete Primer Concrete Membrane Deck Primer. The Epoxy.com Product #882 Concrete Primer Concrete Membrane Deck Primer penetrates and seals the surface to allow for a smoother, pinhole free application. Epoxy.com Product #899 Epoxy Primer is a moisture insensitive 100% solids Low-Mod Low Viscosity Primer and Sealer. It may be used as a primer for any Epoxy.com product, or as a stand alone sealer. Epoxy.com Product #950 Joint Sealant Primer is a one component moisture curing primer formulated to improve adhesion of Epoxy.com Joint Sealants. Epoxy.com Product #950 Joint Sealant Primer Primer is easy to use and provides extra protection in applications where standing water or submersion will be present. Epoxy.com Product #950 Joint Sealant Primer acts to increase bond between organic and inorganic interfaces, binding together weak areas and creating a tough surface. Epoxy.com Product #954 Joint Sealant is a two component extended polyurethane elastomer self-leveling joint sealant for joints in concrete, asphalt, or metal. When poured into a horizontal joint, Epoxy.com Product #954 Joint Sealant is an excellent elastomeric joint sealer with “great memory”. Epoxy.com Product #954 Joint Sealant is also available for machine mixing. Epoxy.com Product #960 Loop Sealant is a 100% solids flexible epoxy resin designed for filling saw cut loop detector joints. Epoxy.com Product #960 Loop Sealant has an easy mix ratio of 1 Part A to 1 Part B by volume. Epoxy.com Product #960 Loop Sealant is formulated for convenience and does not require filler to hold grade when placed in saw cut joints. Epoxy.com Product #964 Polymeric Joint Sealant is a two-component chemically cured polysulfide sealant that provides excellent resistance to bioactivity and the harsh conditions encountered in wastewater treatment plants. Epoxy.com Product #964 Polymeric Joint Sealant cures to a flexible rubber that provides a watertight seal between concrete, masonry, metals, glass, wood, and other construction materials. Epoxy.com Product #964 Polymeric Joint Sealant is available in self-leveling. Use Epoxy.com Product #965 for a non-sag consistency. Epoxy.com Product #965 Polymeric Joint Sealant is a two-component chemically cured polysulfide sealant that provides excellent resistance to bioactivity and the harsh conditions encountered in wastewater treatment plants. Epoyxy.com Product #965 Polymeric Joint Sealant cures to a flexible rubber that provides a watertight seal between concrete, masonry, metals, glass, wood, and other construction materials. Epoxy.com Product #965 Polymeric Joint Sealant is has a non-sag consistency. For a pourable consistency use Epoxy.com Product #964. Epoxy.com Product #1000 Fast Setting Mortar with Migratory Corrosion Inhibitor is a one component trowelable patching mortar designed for overhead and vertical use. Epoxy.com Product #1000 Fast Setting Mortar with Migratory Corrosion Inhibitor is a special blend of fiber reinforced fast setting cement with silica fume, polymeric compounds and aggregates which achieves structural properties in a short time. It is ready to use with just the addition of clean water which activates the modified cement mortar. Epoxy.com Product #1001 Fast Setting Fiber Reinforced Mortar is composed of polymer resin, selected plasticizers, cement, synthetic fibers and aggregates. Epoxy.com Product #1001 Fast Setting Fiber Reinforced Mortar is conveniently packaged in a two part unit to produce the ultimate in bond, compressive strength, and impact resistant properties for a repair mortar. Epoxy.com Product #1004 Self Leveling Floor Topping is a one component copolymer modified cementitious topping. It is ready to use with only the addition of clean water to activate the polymer modified cement topping. Epoxy.com Product #1004 Self Leveling Floor Topping has a special blend of plasticizers to provide zero shrinkage, high flow and bonding properties necessary for floor topping. Epoxy.com Product #1005 Rapid Set Mortar is a non-shrink cementitious blend with exact ratios of graded siliceous aggregates and other ingredients that produce a strong, durable, rapid repair and resurfacing product. Epoxy.com Product #1005 Rapid Set Mortar is easy and fast to use and has excellent durability and workability. Epoxy.com Product #1005 Rapid Set Mortar is ready to use, simply add potable water and mix to desired consistency. It is specifically formulated and manufactured to meet Maryland DOT Class II, Type II rapid setting mortar or concrete. Epoxy.com Product #1008 Rapid Hardening Polymer Repair Mortar is a one component polymer modified, shrinkage-compensated cement-based mortar. It is designed for horizontal concrete surfaces where high early strength gain is required. The blend of special cements, aggregates, fibers and polymers produce a highly durable mortar or concrete in a short time. Epoxy.com Product #1009 Repair Mortar is a polymer modified cement-based topping. It is ideal for leveling and or resurfacing distressed, rough and/or uneven concrete floors. It is easy to use. Add potable water at the jobsite. Epoxy.com Product #1200 Epoxy Organic Zinc Rich Primer is a two component epoxy primer which provides both barrier and sacrificial protection against steel corrosion. Epoxy.com Product #1200 Epoxy Organic Zinc Rich Primer promotes adhesion, dries rapidly, and can be either shop or field applied. Epoxy.com Product #1700 Electrical Epoxy Potting Compound used as an electrical encapsulation material where ease of use and high electrical resistivity are needed. It is a low viscosity, low odor material with a pourable viscosity. It has a convenient 1 to 1 by volume mix ratio and a long pot life. Epoxy.com Product #1700 Electrical Epoxy Potting Compound has a very low exotherm on curing allowing for large parts with extremely low shrinkage. Epoxy.com Product #1800 Fast Setting Brushable Polyurea Coating is a two component brushable aliphatic polyurea. It cures in minutes to provide a tough chemical and abrasion resistant coating. This reaction is very fast, with typical working times of less than 15 minutes. Epoxy.com Product #1800 Fast Setting Brushable Polyurea Coating is recommended for use in areas such as tanks, cooling tower linings, water and wastewater and waterproof deck coatings. Epoxy.com Product #1800 Fast Setting Brushable Polyurea Coating can be used in food and beverage cold storage areas, mechanical rooms, industrial plants, chemical and fertilizer plants, pulp and paper mills and petrochemical facilities. Epoxy.com Product #4240 is a rigid two component closed cell foam impervious to water and moisture. Epoxy.com Product #4240 requires a minimum order. Epoxy.com Product #5000 Expansion Bearing is composed of an upper unit, a thin, stainless steel plate bonded to a sole plate and a lower unit composed of Teflon bonded to a durable, resilient fiber-free pad. Sliding or translation occurs between the stainless steel and the Teflon while deflection, rotation and load distribution are accommodated by the resilient pad. Epoxy.com Product #5000 Expansion Bearing complies with AASHTO standards. Epoxy.com Product #8101 Underwater Mortar is a rapid hardening mortar designed to be applied underwater. Epoxy.com Product #8101 Underwater Mortar is for hand packing or placing. It contains special agents that hold the matrix together in water (non-water separable). Epoxy.com Product #8101 Underwater Mortar requires only the addition of mixing water at the job site. Epoxy.com Acrylic Sealer for Terrazzo is a clear acrylic solution formulated to create a clear, non-yellowing protective coating. Epoxy.com Acrylic Sealer for Terrazzo provides a tough, UV and abrasion resistant film that effectively protects surfaces from moisture penetration, staining, dirt, dust, and wear. Providing a surface that is easy to clean and maintain, Epoxy.com Acrylic Sealer for Terrazzo is an excellent choice for both interior and exterior applications. Epoxy.com Flex Epoxy- Flexible Epoxy Membrane is a flexible resin used as an epoxy membrane and as a flexible epoxy mortar. It is a two component, 100% solids epoxy used as a base in many Epoxy.com Flexible Epoxy Floor and Mortar Systems. It resists cracking caused by horizontal substrate movement, providing a crack resistant, resilient, sound absorbent, waterproof, durable floor. It offers stress-relieving properties for floor slabs that show movement or vibration. Epoxy.com Flex Epoxy- Flexible Epoxy Membrane is excellent for use in areas such as mechanical equipment rooms, large animal rooms and activity centers. Copyright © 1994-2010 EPOXY.COM a division of Epoxy Systems, Inc. – Florida and Vermont. All rights reserved. #697, #698 & #699. Epoxy.com Product #695 Hardener Powder (BPO) for Epoxy.com MMA Flooring Systems dosing can be changed due to temperature and desired set time / working time. leads to the hardening of the MMA begins. agents. Do Not mix With Accelerators. completely before using this or any other Epoxy.com Products. Store in tight containers in dry environments below 80°F. Low temperature accelerators are available for positive cures at temperatures from 32° to 55°F. Excellent resistance to a wide range of chemicals. Easy to apply by conventional painting techniques. Suitable for USDA food handling areas. Quick recoat time 45 minutes to 1 hour. Do not store outside in direct sunlight, storage temperature must be < 80°F. Substrate must be completely dry. the slab (minimum 10-15 mil). vol./gal. @ 32°F up to 2.0 oz by vol./gal. @ -20°F). Air & Floor SurfaceHardener % by Wt. through-hardening. To avoid yellowness do not apply more than 80 mils (20 sq ft/gal.). resin) to Epoxy.com Product #693 Methyl Methacrylate (MMA) Coating. Clean skin with soap and water; use MEK, xylene, or clean proprietary epoxy thinners for equipment. Consult Material Safety Data Sheet for safety and health precautions. will yield 16-32 mils at 50-100 square feet per gallon, average. & amount of hardenerRecoat time45-60 minutesSolids Content100%Mix RatioSee chart aboveViscosity220-225 cps approx.Weight Per Gallon8.1 lbs. black marks can occur from fork lifts and tires skidding. is 6 months in the original unopened containers. Use only as directed. If substrate and/or material temperature is above 90°F, DO NOT apply material. Epoxy.com products, or visit http://www.epoxy.com/. You are currently browsing the archives for the Flexible Decking category.